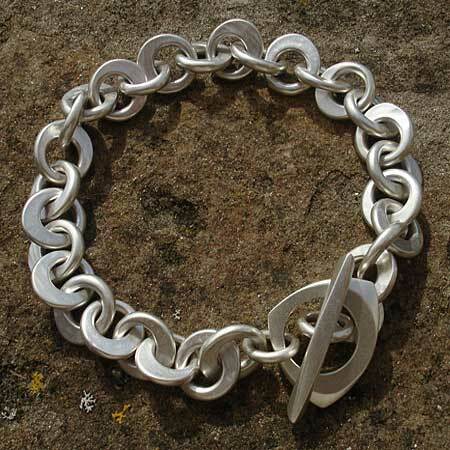 Women's Contemporary Silver Chain Bracelet : LOVE2HAVE in the UK! 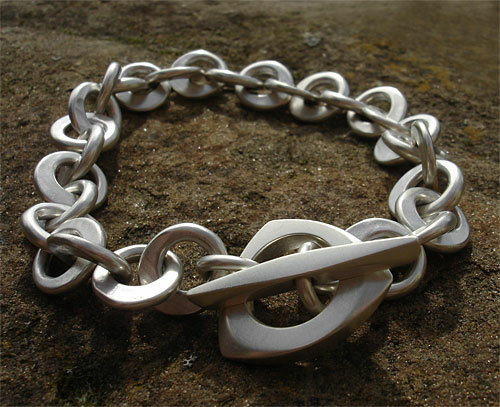 A women's contemporary silver chain bracelet. Women like their chunky jewellery too and with Love2Have being the best place on the web to find women's unique jewellery then look no further than this piece. This contemporary bracelet both epitomises chunkiness and designer styling in a single package. The links are like no other and have a smoothed oval type shape to them, each individually tapered into flatly rounded profiling. The links have offset holes, and they thicken and thin, it all looks very contemporary and most unusual. At its widest point, the chain measures 12mm and the T-bar, 30mm. Again, the T-bar is highly stylised with smooth curves and chamfered edging. The silver finish, being a luscious, silky matt, subtly reflects the light and therefore avoids the tacky feel of cheap over polished silver. The standard size is 8.5 inches, but we can accommodate other measurements too if you so wish. Email us for further details.